This aerial view looks east toward Oroville Dam and Lake Oroville, showing the damaged spillway with its outflow of 100,000 cubic feet per second (cfs) at the Butte County site. The California Department of Water Resources has a goal to lower the lake level by 50 feet to handle the next round of winter storms. Photo taken February 15, 2017. Dale Kolke / California Department of Water Resources. When operators at the nation’s tallest dam discovered a sizable section of missing concrete along its 178-foot-wide main spillway earlier this month, they did what most would assume they would do – slow the flow of water down the chute. 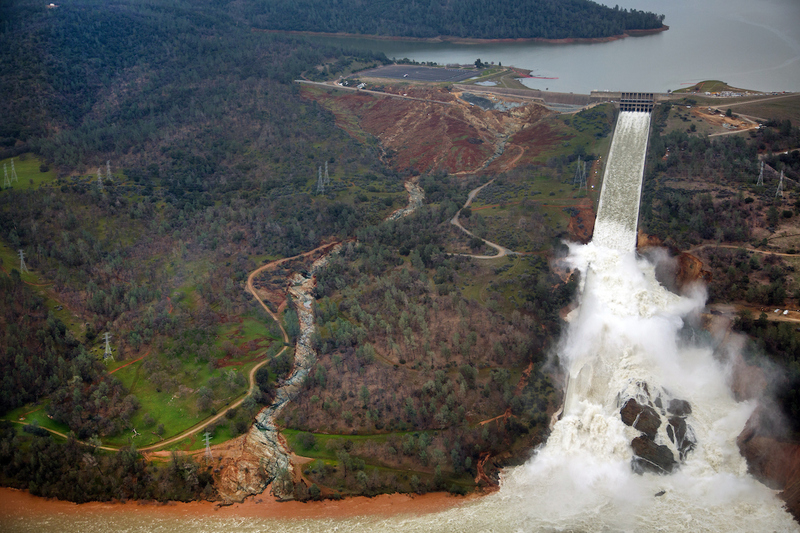 During this reduction, the water level of Northern California’s Lake Oroville peaked and an earthen emergency spillway was utilized for the first time. As water rushed down the spillway, the hillside below was significantly eroded. The possibility of hillside collapse prompted the evacuation of more than 180,000 residents along the Feather River and raised questions as to the cause of both spillway failures. The California Department of Water Resources has suspended flows from the Oroville Dam spillway after a concrete section eroded on the middle section of the spillway. There is no anticipated threat to the dam or the public. DWR engineers are assessing the options to repair the spillway and control the reservoir water level. The Butte County facility is the tallest dam in the United States at 770 feet and is a key part of the State Water Project. Photo taken February 7, 2017. Kelly M. Grow/ California Department of Water Resources. A process dubbed cavitation is to blame for the damage to the main spillway, according to dam experts cited in the media. Cavitation is a process that occurs when large volumes of fast-flowing water rumble over small cracks and other imperfections in concrete dam spillways. When the water hits the surface of a chute, significant turbulence is created, which can form tiny water vapor bubbles that collapse with a force powerful enough to chisel away at concrete. 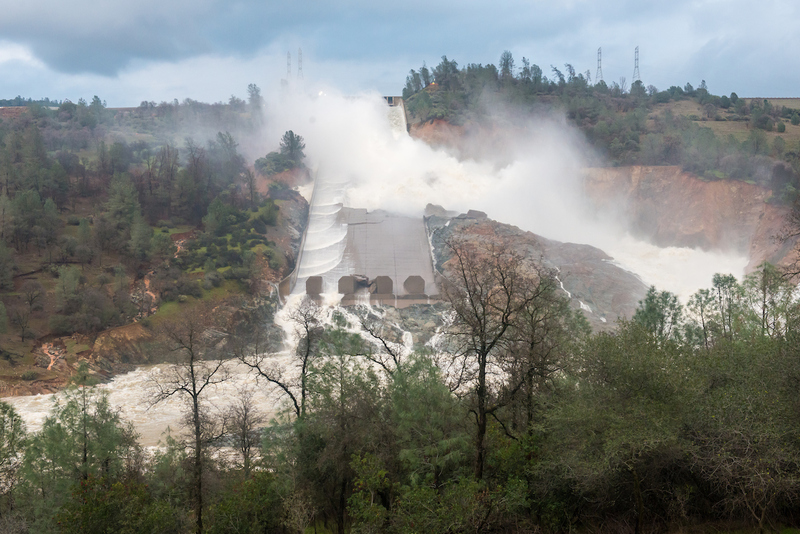 Spillways are often retrofitted with aerators, which reduces the risk of cavitation; however, Oroville’s chute had not been upgraded, with only crack-related repairs occurring in 2013. 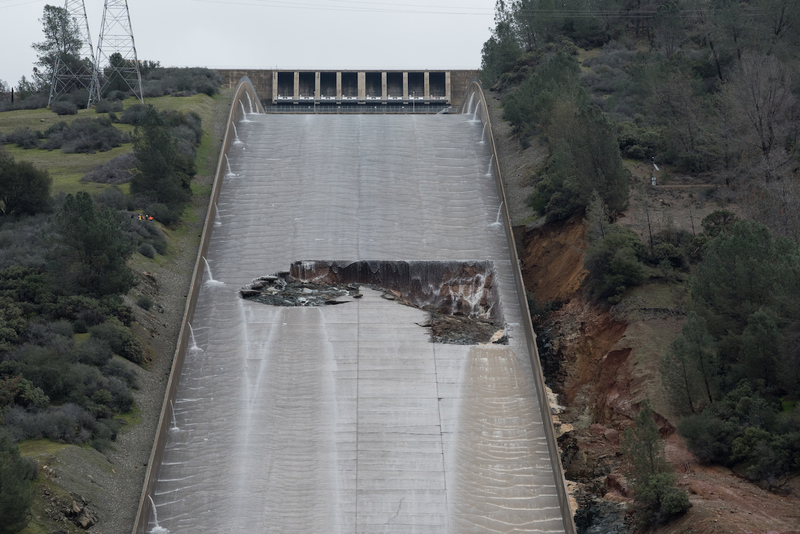 This fact, combined with a maximum concrete thickness of only 15 inches, made the spillway a prime candidate for the type of failure it experienced. Construction crews work around the clock, placing tons of material each hour into areas affected by erosion near the Oroville Dam emergency spillway in Butte County. Photo taken February 20, 2017. Zack Cunningham / California Department of Water Resources. Another theory suggests that California’s recent, record-long drought caused the soil under the main spillway to dry and shrink, creating a void of several inches between concrete and dirt that was then exposed to large volumes of fast-moving water. The erosion of the earthen emergency spillway’s hillside was not a huge surprise, as the area lacked a concrete lining – this being a long-time point of contention for environmental groups. In 2005, organizations including the Sierra Club requested that the state line the emergency spillway with concrete, fearing catastrophic erosion could occur if it was ever utilized – the same reason for the recent evacuations. The request was rejected at the time and deemed unnecessary. The Oroville Dam main spillway is flowing at 55,000 cubic feet per second at the Oroville Dam in Oroville, California, allowing engineers to get a better look at the damaged spillway at Lake Oroville in California. Oroville is a city in Butte County. Photo taken in the late afternoon of February 18, 2017. Florence Low / California Department of Water Resources. On February 7, dam operators observe turbulence in the water rushing down the main spillway’s chute. 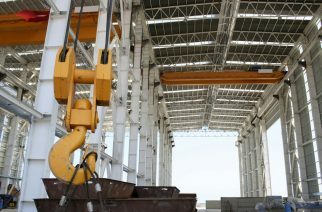 Upon reducing water flow, operators discover a large missing concrete section. Water releases remain slow for the next four days, wherein the lake rises by nearly 50 feet thanks to heavy storms. On February 11, the lake reaches its peak of more than 902 feet and overtops the emergency spillway. Rushing water coming down the earthen emergency spillway causes the hillside to erode badly, prompting state officials to order the evacuation of more than 180,000 residents along the Feather River. Observed erosion has raised concerns that the spillway could collapse, causing catastrophic flooding if further utilized. Erosion of the emergency spillway forces dam operators to increase water flows down the broken main spillway, which now features a rock-filled crevice – the result of helicopters dropping bags of boulders into the damaged section. Re-utilization of the main spillway and the filing of nine upstream reservoirs drops the lake’s level down roughly 50 feet in a week. The volume of water flowing down the spillway is reduced to around 55,000 to 60,000 cubic feet per second. 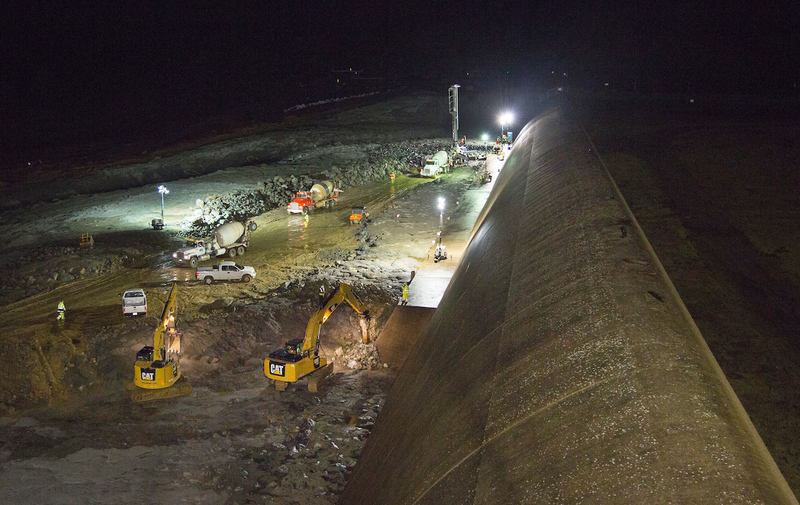 Crews place rock, aggregate, and cement slurry into the emergency spillway’s eroded areas. 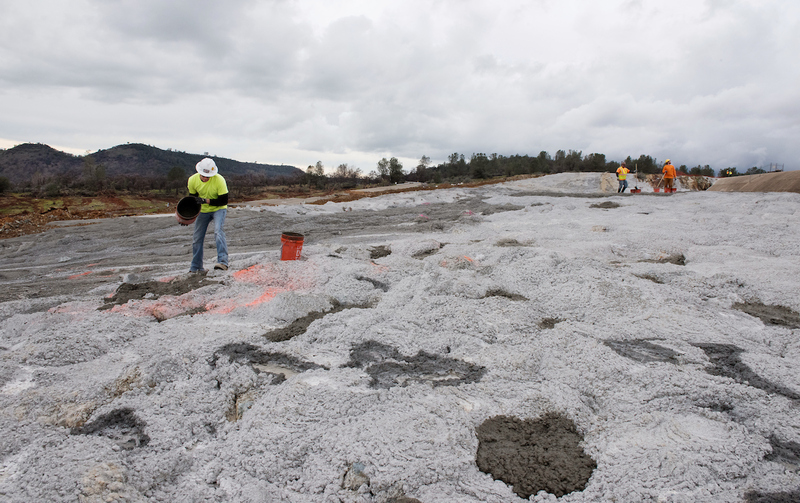 Contractors for California Department of Water Resources continue to repair the erosion areas with a cement slurry overtop rocks just below the Oroville Dam emergency spillway at the Butte County site. Photo taken February 21, 2017. Kelly M. Grow/ California Department of Water Resources. Currently, the damaged main spillway is still deteriorating, with state officials expecting further erosion as repairs are made. While the spillway’s left side now runs into earth, officials insist the chute is stable and that continual monitoring will occur as it is improved.